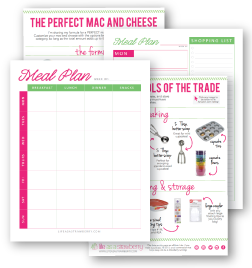 These easy (and sustainable!) 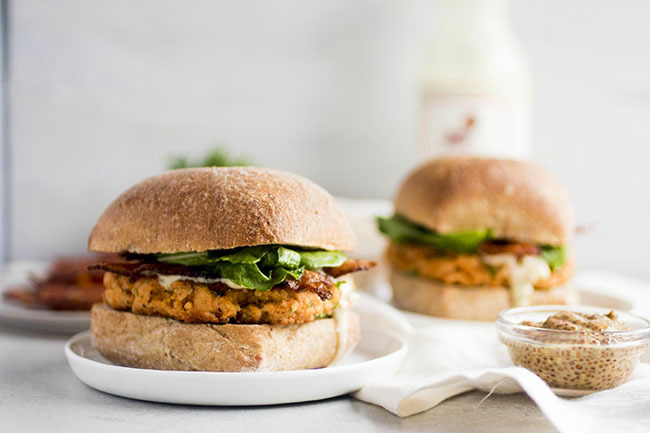 homemade salmon patties make rich, flavorful burgers that the whole family will love. 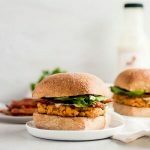 Build your salmon burger as directed or use the salmon cakes as a standalone dish for a low-carb option! 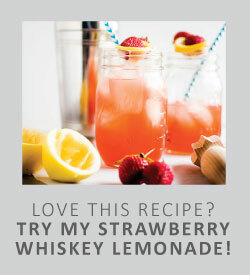 Thanks to my friends at Saucy Mama for sponsoring this recipe! I seriously don’t even know where to start with these salmon burgers. Except to tell you that they’re pretty much my new best burger friends. Liiiiiiike, to the point where I made them for breakfast one day. Because sometimes a food blogger’s gotta do what a food blogger’s gotta do. 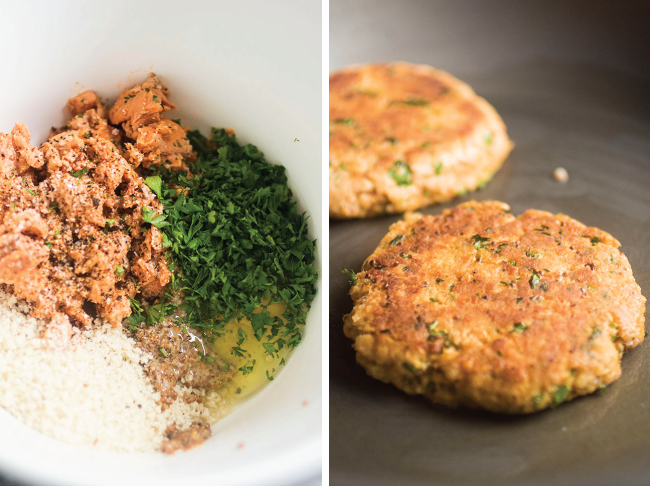 The salmon patties are super simple – just some (sustainable!) canned salmon, a couple of eggs, bread crumbs, mustard, salt and peppaaaaaa, and fresh parsley. BOOM. The patties also freeze really well, so you can easily make and form the salmon cakes ahead of time. 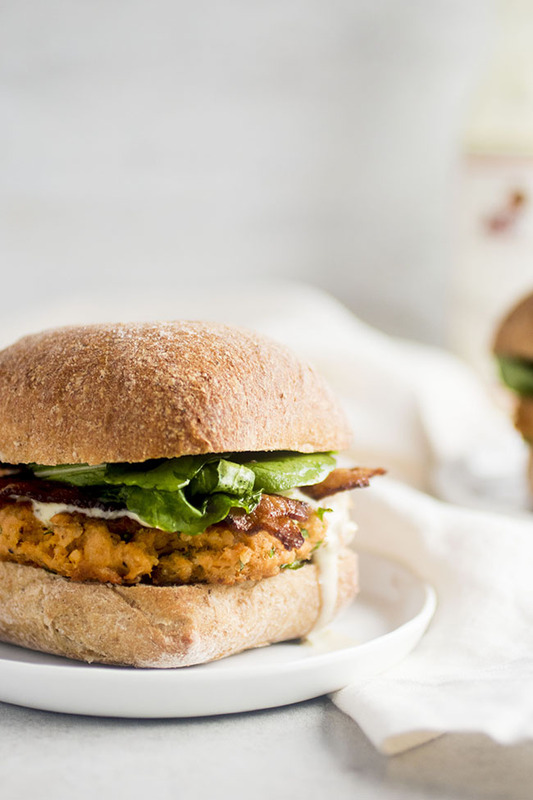 If you’re not in a burger mood (which I know is NEVER, but just roll with me here for a minute) these salmon patties are also great in sandwich wraps or on top of a simple caesar salad. PS – Don’t be afraid of canned salmon! For some reason, a lot of home cooks I talk to are kind of canned-salmon-averse, but if you haven’t tried sustainable, wild-caught canned salmon YOU ARE MISSING OUT. Look for wild-caught canned salmon at the grocery store or order online – Vital Choice has some great options! 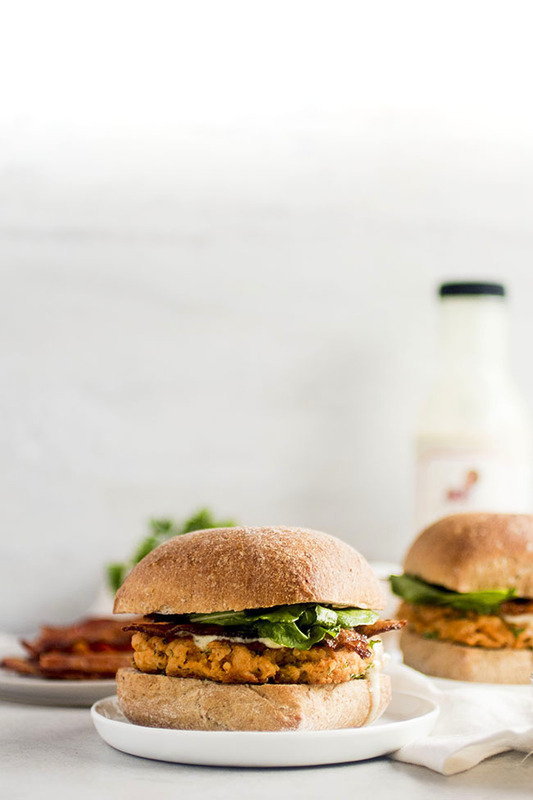 Easy salmon burgers with bacon and fresh arugula. Cook bacon in a large skillet over medium-high heat until crispy. Remove cooked bacon to a paper-towel-lined plate and set aside. While bacon is cooking, use your hands to mix together salmon, bread crumbs, Brat Mustard, lemon juice, eggs, parsley, salt, and pepper in a large mixing bowl until well combined. Line a plate with a piece of wax paper. Divide salmon mixture into four equal-sized portions, and use your hands to press each portion into a burger patty shape, about ½-inch thick. Place formed patties on the wax-paper-lined plate and set aside. Heat the 2 tsp. of olive oil in a large nonstick or cast iron skillet over medium-high heat until shimmering. Place salmon patties into skillet and cook for 2-3 minutes on each side until patties are browned and crispy. Remove to a paper-towel-lined plate and get ready to assemble your burgers! Toast sandwich roll halves until lightly browned. 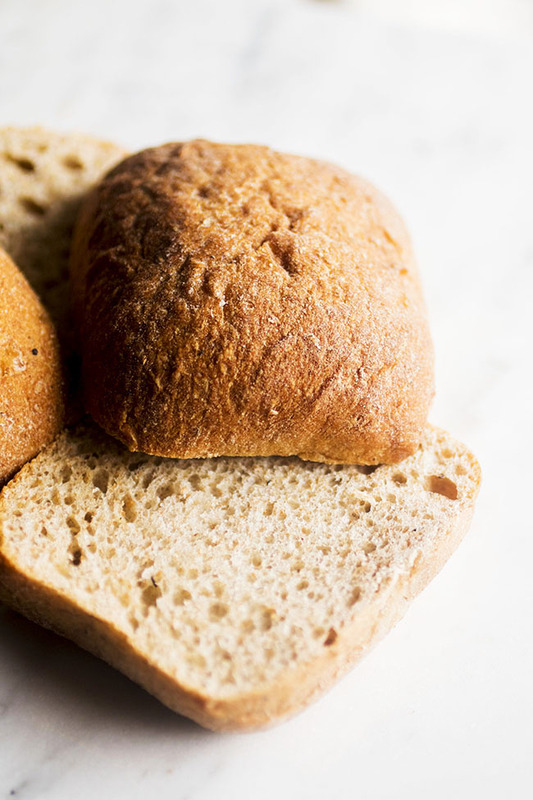 I like to lay the rolls out on a baking sheet and bake at 375 degrees F for 4-5 minutes until toasted, but you could also use a regular toaster or toaster oven. In a small mixing bowl, toss together arugula, olive oil, lemon juice, salt and pepper. Toss until arugula is lightly coated, and set aside. To assemble, spread a teaspoon or so of Poblano Ranch across the bottom piece of each toasted sandwich roll. 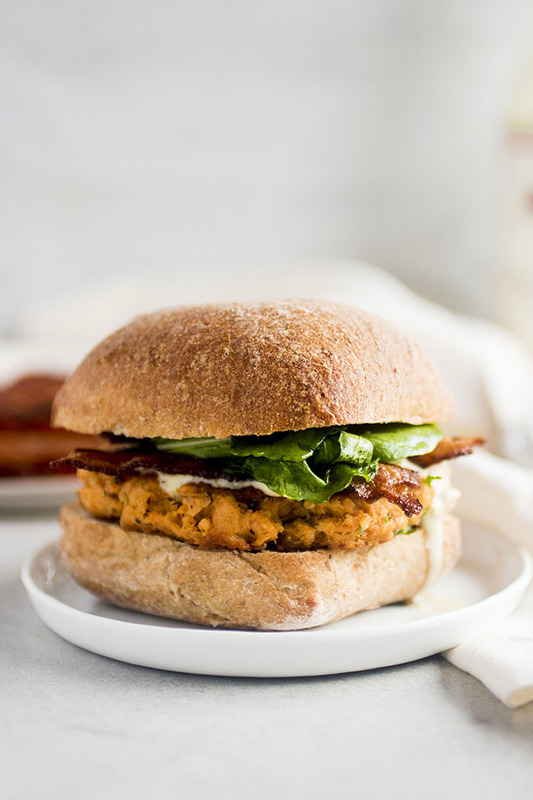 Top with a salmon patty, then another heaping teaspoon of the Poblano Ranch, followed by two pieces of crispy bacon and a few leaves of arugula. Top with the other half of the toasted sandwich roll and serve immediately. Uncooked salmon patties store well in the fridge or freezer if you’d like to make them ahead of time – just cover them with plastic wrap or place them in an airtight container to store! Patties will keep in the fridge for 2-3 days and in the freezer for several months. Canned salmon isn’t always top-of-mind to home cooks, but there are actually a TON of delicious, sustainable canned salmon varieties out there. Look for WILD CAUGHT canned salmon at your grocery store or buy my favorite canned variety here. If you don’t have any canned salmon, you can process your own salmon fillet. Buy a 1 lb. fillet, remove all skin and bones, dice up the fish into large chunks and then use your food processor to chop it into fine pieces. Proceed with the recipe as directed, although you may need to adjust the cooking time to be sure the fish is thoroughly cooked. These were absolutely fantastic. 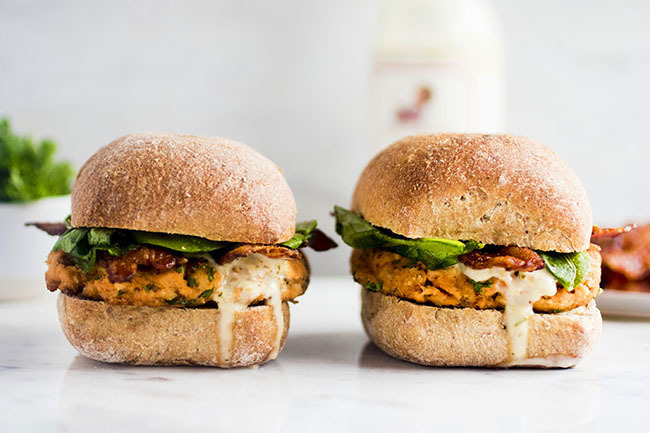 I just made these for lunch today and I am so glad I did. I’m so happy you liked them! These burgers have definitely become a new favorite around our house. Thanks for letting me know how they turned out! uhhh YUM!! These look fabuloso, and I just so happen to have some wild sockeye canned salmon in my pantry! MDW menu is now SET! Wahoo for wild salmon! Thanks, Coley!